I really should have started writing a blog about this a long time ago. I don't know what my resistance to this process is about. My first art project blog was over 5 years ago. Since then I have done two big public art projects where blogging was an integral part of the process and the work. It has clearly become a major part of my artistic practice. Why have I been avoiding it with this project for so long? Did I feel like it wasn't enough for this fellowship, like they expected more or something else from me. Maybe that is part of it, but I think it has something to do with putting on a show, pretending to be something that I'm not. It is time to stop trying to be what I think someone else wants me to be (I've come to this point before, at the end of high school) and just start being myself. Transparency. When I write these blogs about these art projects I am doing I am completely transparent. All my fears and insecurities and self doubt are exposed. I thought that since I got this vote of confidence in the form of a fellowship I'm not suppose to be insecure and have self doubt. I though that if they knew how insecure and scared I feel they would think they made the wrong choice. But if they read any of the blogging from my past major projects they would know that already, and they chose me anyway. Maybe because they also saw in the projects that I never gave up. That I fight and I stick with it. I've got a new project I'm really excited about, well new in that I haven't written about it in a blog yet. The idea came to me about a month and a half ago. 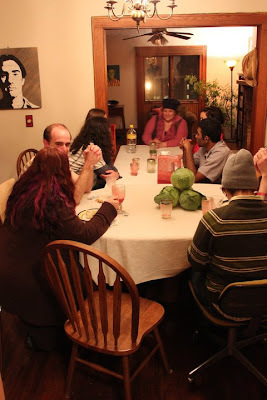 I'm throwing a series of Sauerkraut Dinner Parties as art events. It is kind of inspired by something either Ken Rinaldo or Amy Youngs said; artists are meaning makers. That phrase really struck me. It helped me understand what I had been doing for the past several years with my tofu dinner parties, and it helped me to focus it. I started asking questions. What is the meaning that I am making? How do we make meaning? How do humans understand meaning? I realized that metaphor is at the core of creating meaning. The tofu dinner parties were all about me, about my childhood, my identity, about me finding my community. They had meaning for me. So I asked myself, what other kinds of dinner parties can I organize to create meaning for others as well. And I came up with Sauerkraut. But I'm really tired now because I just had my second Sauerkraut Dinner Party, so let me tell you all about it later.